~ One minister emailed the entire congregation asking them to talk about the baptism of each person in their household before coming to church on this Sunday. Those stories formed a personal context for each worshiper as they explored baptism together during worship. 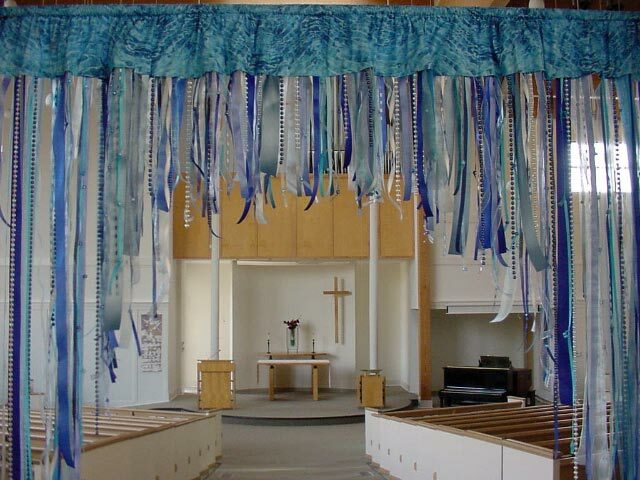 ~ If you hang curtains of blue ribbons in the doors to the sanctuary on baptismal Sundays, hang them today in honor of Jesus’ baptism. At the very least they provide an introduction to the story of Jesus’ baptism that connects his baptism to that of each worshiper. It is also a chance to suggest to worshipers that every time they pass through those curtains they can remember and thank God for their own baptism. In the charge and benediction, remind worshipers to remember their baptisms as they leave the sanctuary through the ribbons today. If you have a children’s time, explain the practice and lead the children out the doors and back through the curtains. ~ During the sermon walk through and comment on your congregation’s baptismal rite. Even use a doll and adult volunteers to take the various roles in both infant and adult baptisms. ~ Invite the congregation to recall and celebrate their baptisms by coming forward, dipping their fingers into the baptismal font, and saying silently, “I belong to God,” “I am baptized” or some similar phrase. ~ If you include renewal of baptism in the service and your congregation practices infant baptism, provide a chance for parents and the congregation to recall and renew their vows to the children. Parents can stand in place with their children to hear and answer the questions. This is an opportunity for children to hear their parents renew their commitments to them, for preachers to offer a few specific suggestions about how to keep those promises to growing children, and for parents to reclaim their commitments made to infants in the presence of those children as they grow. Follow it with time for hugs – or passing the peace, if you want to stay within the liturgy. “Christ When For Us You Were Baptized” – Note that the first 3 verses are about Jesus’ baptism. Read verse 1 emphasizing Spirit and dove from Luke’s story. Point to the “My Beloved Son” at the beginning of verse 2. Read through verse 3 simply noting that Jesus obeyed after he was baptized. Then, explain that verse 4 is about us and our baptisms. We ask to be empowered by God’s Spirit as Jesus was and to serve obediently as Jesus did. 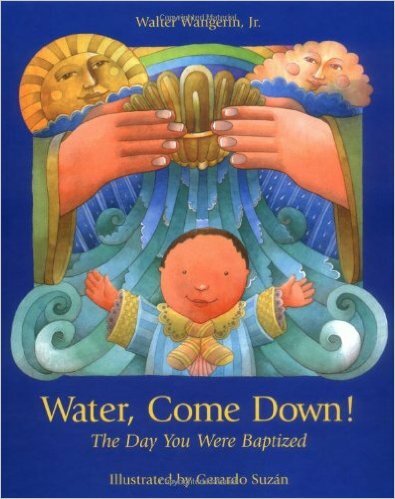 ~ Water Come Down: the Day You Were Baptized, by Walter Wangerin, Jr. describes how sun, cloud, rain, wind, and water are involved in a child’s baptism. The idea is lovely, but a little over the top. The whole universe seems to revolve about the child rather than the child taking his or her place among God’s people and the universe. One way to use it in worship would be to read only the end of the book beginning with “Your family was there that holy day…”after walking through your congregation’s infant baptism rite. 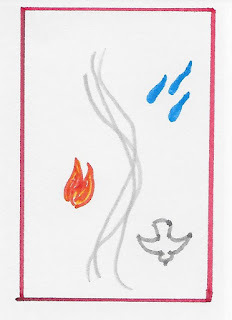 ~ If your focus in on the role the Holy Spirit plays in today’s texts, at the beginning of worship introduce four symbols for Holy Spirit – wind, fire, water, and a dove. Briefly tell what each tells us about Holy Spirit and challenge worshipers to listen for these symbols in worship today. Water like the Holy Spirit can wash us clean of all that is dirty in our lives. It can also wash away the sin of the whole world (think Noah’s flood). Dove. Luke says the Holy Spirit descended above Jesus in the form of a dove. Ever since then doves have been the symbol of the peace God’s presence brings. 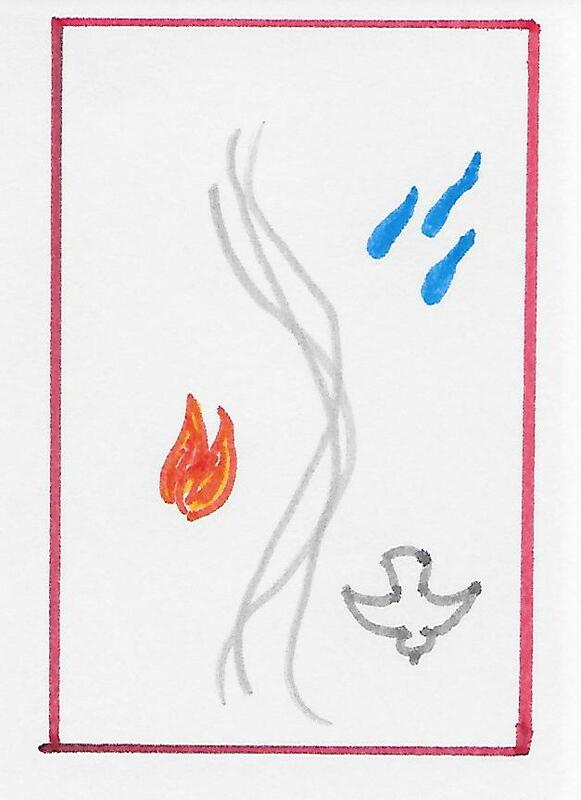 1. displaying a poster or banner of each symbol or displaying them all on a single red Holy Spirit banner/poster. 2. Giving children streamers in Holy Spirit (red, watery blue, windy white, dove gray) colors to wave during an opening Holy Spirit hymn. 3. If you have a big space, consider flying a Holy Spirit dove over the congregation as the gospel is read or a Spirit song is sung. Go to Order site. $72 is steep, but I suspect that once you have this, it will fly on other Holy Spirit Sundays. Disclaimer: I have seen Dove Kites used in worship frequently, but have not used this particular product. Two phrases in this passage speak to children. “I have called you by name, you are mine” (verse 1) and “Do not fear, I am with you” (verse 5). Those phrases will have to be presented specifically because the children will not hear them as the passage is read. ~ Talk about our “whole names.” Tell your whole name and ask several worshipers to tell theirs. Note that most days we are called by parts of our whole names or even by nicknames, but that on special occasions we are called by are whole names. When we are in trouble we are often called by our whole names so we know it is us, nobody else, who is being called to explain what we have done. At weddings, the bride and groom are addressed by their whole names to make sure everyone knows for sure who is making the important promises. Also discuss what forms of names your congregation uses at baptism and confirmation and what they signify. Then go back to Isaiah’s promise that God knows our whole names, God knows each of us completely and says that we belong to God. ~ Suggest using this phrase as a breath prayer. Breathe in while saying, “I have called you by name.” Breathe out while saying, “You are mine.” Practice saying it together. Imagine saying it when you have done something really fine or are having a great day. Also, imagine saying it when things are going really badly. If it is report card time in your community, imagine praying it when you get straight As and when you get really lousy grades. ~ Remind the children (and worshipers of all ages, maybe especially parents) of David who had 7 older brothers. Imagine together how he felt when all his older brothers went off to fight together and he had to stay home to take care of the sheep and when all his older brothers went to the feast with the prophet Samuel and he had to stay home to take care of the sheep – again! Then briefly tell how Samuel asked if there wasn’t another brother and refused to eat until David was brought to him. When he saw David, Samuel anointed him to be the next king. Note that God knew David and claimed him even when he was just the kid brother to everyone else. ~ Read all or part of The Kissing Hand, by Audrey Penn. To give her child courage to go off to school a mother raccoon kisses his hand and tells him that whenever he feels lonely or frightened he can put his hand to his face and feel her love. He returns the gesture to give his mother courage to get through the day without him. See it read aloud with book illustrations above. ~ No matter which hemisphere we live in January can be a time of frightening storms – cyclones, thunderstorms, blizzards, etc. They seem to be getting more frequent and more violent. Connect Isaiah’s insistence that we not be afraid with Psalm 29’s description of a big storm. You might even turn the psalm into a responsive reading with the congregation responding “Do not be afraid, for I am with you” after each verse or phrase of the psalm. ~ To explore other situations in which we are called to be brave, check the note about If I Never Forever Endeavor near the end of this post. ~ Write the phrases of Isaiah 43:4a on separate cards and wrap each as a gift. Hide them around the sanctuary. Send children to find them. Together unwrap them and put them in order. Insist that God says this to us at our baptism and every day of our lives. This conversation could lead to splashing water over the children/whole congregation to recall their baptisms and God’s love. (Adapted from an idea in the Mustard Seeds blog. kid's talk, unwrap them and sort the words into the verse. Talk about How our baptism is summed up in these words and is a gift from God to us. ~ Like many psalms this one needs to be experienced rather than explained. So, try one of the reading plans that have been posted as this psalm appeared in the lectionary to date. (It is popular with the lectionary creators!) Go to Baptism of the Lord - Year B for a script that emphasizes the question “How strong is the Lord?”, directions for stormy sound orchestras to accompany the psalm reading, suggestions for drawing storm pictures, even a rainbow connection. ~ Both these texts are about baptism and the power of the Holy Spirit. Children make quicker sense of Luke than of Acts. The Holy Spirit is actually more important than the water in these baptism stories. 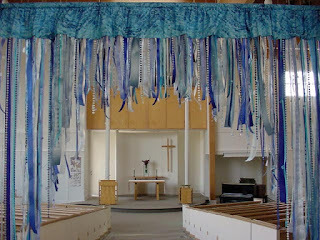 ~ Decorate the sanctuary with a large dove mobile or banner. Near the end of the service, give smaller doves to worshipers to take home to display where they will see it frequently and be reminded of God’s Spirit empowering them. ~ If there are flames in your denominational logo, display that logo. Point to the flames and explain why they are there. ~ If you use the Apostles’ Creed regularly in worship, point out the phrase “I believe in the Holy Ghost.” Explain that Holy Ghost is another name for God’s Spirit or Holy Spirit. When we say this phrase we are saying that we can feel God with us taking care of us and empowering us to do important work. Tell stories about sensing God with us in worship, while doing mission work, in happy times and in hard times. Practice saying the phrase several times, then say the entire creed. This could be done in a children’s time or with the whole congregation just before reciting the creed. ~ “You are my Son, the Beloved. In you I am well pleased” echoes Isaiah’s “I have called you by name. You are mine.” Children like that God says this about Jesus before he has taught anybody, healed anyone, or died on the cross. At the beginning of a new year, this especially reminds children that God loved Jesus and loves us not because of anything we do but just because God loves us. Period. 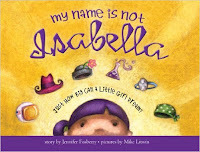 ~ Read the first few imaginative pages of My Name Is Not Isabella, by Jennifer Fosberry. 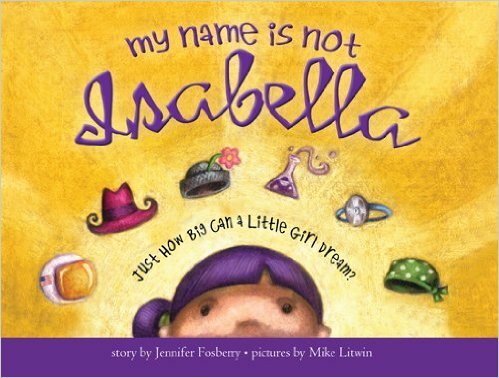 Instead of identifying each of the women Isabella imagines herself being, simply say, “We all do just like Isabella. We imagine ourselves lots of different people. (Name a few current hero/ines children might be imagining themselves being. )” Note that such imagining is good for us. But, insist that no matter who we imagine ourselves being or who we actually become, each one of us is first of all God’s loved child. ~ No Name Calling Week is January 18-22. In some schools this will be a week of emphasis on not bullying. Go to No Name Calling Week 2016 for this year's details. One recurring focus of this effort is on the impact being called positive or negative names. Check out No Name Calling Images for some posters about name calling. Display one or two of them, then ponder how Jesus felt when God called him “Beloved Son.” Insist that we make a big difference in people’s lives when we call them by positive or negative names. But, this is also the beginning of Jesus ministry. He knows who he is and that God is with him, so he goes to work. Like him, we know who we are and that gives us the power to go to work. 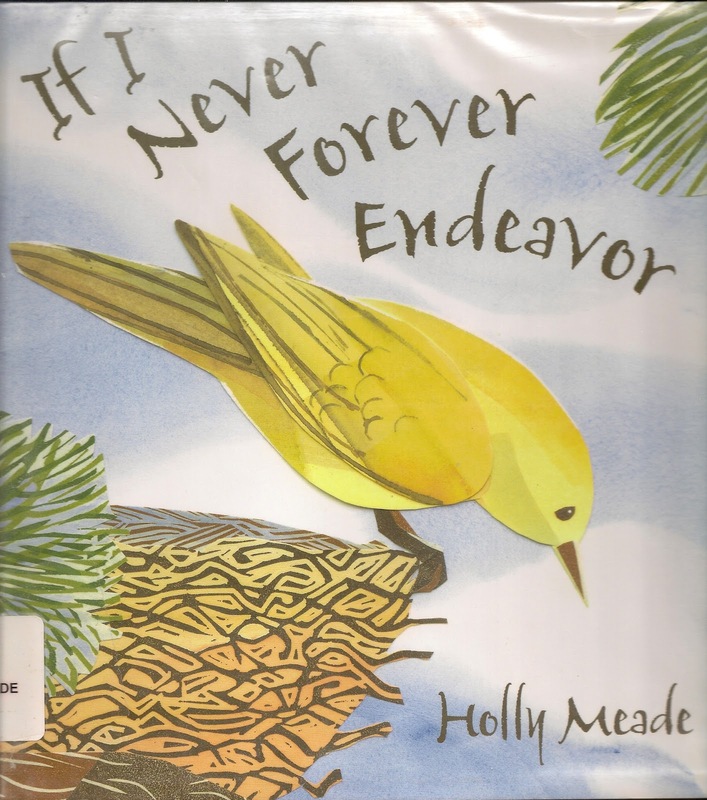 ~ If I Never Forever Endeavor, by Holly Meade, is one of those picture books for all ages. A young bird tries to decide whether to attempt flying. He worries about what might happen if he fails and wonders what will happen if he succeeds. Finally, he tries and after a thud or two succeeds. Everyone who has ever been afraid to try something new understands. Today read it and connect to trying to walk, jump off the diving board, go on a mission trip, go to kindergarten, take on a being a church officer for the first time, go to college, help at a homeless shelter with your family, etc. The point is that being called by God means we have to be brave enough to try to do all the things God made us able to do – just as the bird must be brave enough to fly. NOTE: Do define “endeavor” as “try” before reading the book. SECOND NOTE: If you cannot get a copy of this book, try Let’s Go, Hugo! By Angela Dominguez. Hugo is also a bird afraid to fly. His reasons for conquering that fear include wanting to see the Eifel Tower and to be with a potential new bird friend who does fly. That makes the first book a more straight-forward choice. But, this still works in a pinch. ~ If you are installing new church officers, connect their new ministries with Jesus undertaking his ministry.